Let's face it, books about global warming are going to have a tough time competing with The Famous Five, Harry Potter, and Percy Jackson. 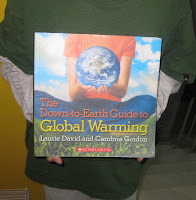 The Down to Earth Guide about Global Warming book makes a sincere effort to do so. Its colourful layout and straightforward prose are appropriate for the book's target audience--children eight and up. Although it was originally published in the US -- and was clearly written for American children -- it's been brought out by Scholastic India and is readily available here. "It's OK, I guess. It has good examples and pictures that sort of explain it. It has interesting facts like this one: 'One tree can absorb the amount of CO2 released by an average car that's been driven for 4,000 miles.' The bad side? It's about global warming, and that's kind of boring. I'd rather read fiction." There is a lot to like about The Down-to-Earth Guide to Global Warming. One of the authors, Laurie David, produced Al Gore's documentary, An Inconvenient Truth, and she clearly knows her stuff. The explanations of subjects like the greenhouse effect, mass animal extinctions and extreme weather do a nice job of putting real science into language kids (and adults) can understand. But two things troubled me about this book: it's annoyingly cheerful tone and it's unwillingness to be honest with children about some important issues. First, in order to make global warming exciting for young readers, the authors have put a chipper, cheerful...cutesy spin on just about everything, including things that are not cute. In the chapter Extinction Stinks, there are sections like, "Kiss this Toad Good-bye" and "Don't Put Bleach in the Colors, Um, Corals." Call me an old fashioned, but the largest mass extinction event since the dinosaurs just isn't something I want to joke about over and over again. Similarly, the section on extreme weather is called "Heat Waves: The X-Games of Summer" and opens with a picture of an extreme cyclist; the chapter on rising sea levels is called, "Beach Bummer" and includes this "fun fact", which you can also read on the Scholastic Website, "If the Greenland ice sheet melts completely, it will add enough water to raise sea levels all across the world by 21 feet (6.4 m)"
Let's imagine for a moment what this might mean: much of Bangladesh, Mumbai, New York City and maybe even Los Angeles underwater, millions of desperate climate refugees heading for Delhi and Chicago...Wow. What a bummer! "We've spent a lot of time talking about why burning fossil fuels is so bad. Now it's time to hear about why the future of fuel is good. There are other ways we can drive our cars, and manufacture our products." David and Gordon then go on to exclaim that nearly all "alternative" fuels "rock", even industrially produced bio-fuel which results in more hunger AND more greenhouse gases than petroleum because we are cutting down rain forests (which absorb CO2) in order to make room for bio fuel crops. And the book says nothing about the failure of the United States government to take any meaningful action on climate change, but it makes much of the fact that mayors all over the US have signed symbolic commitments to reduce their cities' emissions. Sorry, but putting a positive spin on the United State's efforts to reduce emissions requires too much...spin to qualify as honest. Copenhagen certainly didn't do anything to change that fact. Even children should be told when governments are failing them. Again, we don't want to overwhelm young people with bad news, but it is fair to them to be a little more realistic. The Story of Stuff, also for children, manages to do a much better job of this, I think. Our children deserve more honesty because they are the ones that will have to live with the mess we're creating. This book does a lot of good, but it is fundamentally misleading in parts; both children and adults should read it, but they should read it critically! Note: I wrote Scholastic to ask them for permission to use a thumbnail image of the book, and do you know what? A nice woman named Samantha wrote me back a letter explaining how to properly ask for permission to do that. It involved downloading forms and sending them back via fax machines, so I said, no thanks. That's why my son is holding his copy of the book in the picture that goes with this post. Hope THAT'S not going to get us in trouble! In fact, Scholastic explained that I needed permission to actually link to their site! I docked them a half a green star for being so unhelpful! hah! i'm surprised they didn't ask to vet your post before you put it up. Aniruddha Sen Gupta's illustrated book 'Our Toxic World'- published by Sage, Rs. 395. Would be interested in knowing what The Dhaba makes of it. @Space Bar--i'm sure they would have if they'd thought of of it!